GREEN BAY – The Stratford volleyball team finally met its match in defending state champion Lake Country Lutheran. Stratford, playing in its first state championship match, couldn’t get its offense going in the middle two sets and Lake Country Lutheran was pounding the ball all around the court. 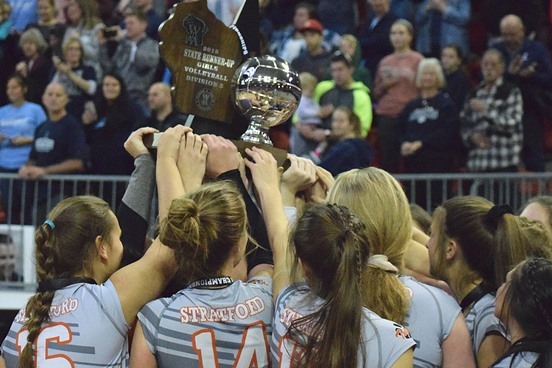 It proved too much for the Tigers to overcome and Lake Country Lutheran was able to pull out a 3-2 victory in the Division 3 championship match at the 2018 WIAA State Girls Volleyball Tournament at the Resch Center on Saturday. The Lightning won 23-25, 25-16, 25-17, 21-25, 15-7, to win their second state title in three trips. Stratford was making its second-straight trip to state after losing in the semifinals last season. This year the Tigers will take home a silver ball as the runner-up, the first state tournament trophy in the program’s history, and finish the year with a 44-1 record. A kill and a service ace from Lauryn Nagel helped Stratford in an 8-1 run that pushed them to a 19-12 lead in the first set. Lake Country Lutheran chipped away but was not able to overcome the Tigers, who won 25-23. Despite the victory, a trend was beginning for the Tigers. They were unable to get consistent points from their offense, while also having trouble defending a front row from the Lightning that had multiple weapons. LCL took control of the second set early, running out to a 6-1 lead with the help of three kills by Jennifer O’Keefe, who had a match-high 22 kills. Two kills by senior Mazie Nagel, who had 18 kills to lead Stratford, kept the Tigers within striking distance at 15-10, but the Lightning ripped off runs of 3-0 and 5-0 to put away the game and even the match. The third set was more of the same for the Lightning. Breanna Pape had three kills and a block kill, and Gaby Garcia added two more kills as Lake Country used an 8-0 run to turn an 11-10 deficit into a 19-11 lead. Stratford had only five points from its offense in the game – with two coming on block kills and the rest on LCL errors – as it fell 25-17. With the end of the season staring them in their face, the Tigers came out roaring in the fourth set. The Tigers scored 11 of the first 14 points, two on kills by Lauryn Nagel and two more on aces by Tanaya Schillinger and Brooke Peterson. Lake Country Lutheran chipped away late, climbing to within three after falling behind by as many as 11, but the Tigers were able to close out the win, evening the match again after a kill by Jadyn Dahlke. Lake Country Lutheran turned to its big front row again in the fifth and deciding set. Evvie Kaczkowski, one of four Lightning players with double-digit kill totals with 10, had three in the final set. O’Keefe added a pair of kills in a 4-0 run to close out the win, 15-7. Dahlke had 22 assists, and Peterson had 14 assists and nine digs for Stratford. Mazie Nagel added a team-high 22 digs and junior Libero McKenna Krall had 19 digs in the loss. In addition to O’Keefe and Kaczkowski, Pape and Garcia also reached double figures in kills with 15 each. Junior setter Alayna Ritter set a Division 3 state tournament match record with 61 assists, the seventh-highest total ever in any division. Division 2: East Troy (30-8) vs. Kettle Moraine Lutheran (31-10), 2 p.m.
Division 1: Burlington (38-5) vs. Oconomowoc (31-7), 4:30 p.m.
Paul Lecker is publisher of MarshfieldAreaSports.com and a contributor to focusonmarshfield.com.